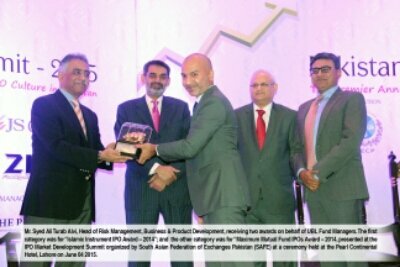 UBL Fund Managers Limited (UBL Funds) received two awards at the IPO Market Development Summit organized by South Asian Federation of Exchanges Pakistan (SAFE)at a ceremony held at the Pearl Continental Hotel, Lahore on June 04 2015. UBL Fund Managers, one of the leading asset management companies in Pakistan and a subsidiary of UBL Bank claimed their awards in two major categories at the Summit.First category was of “Islamic Instrument IPO Award – 2014”; and the other category was “Maximum Mutual Fund IPOs Award – 2014.” Earlier in 2013, UBL Funds had also won the Most IPO’s launched award at the Pakistan IPO Summit in February 2014. UBL Funds launched 3 Islamic Instrument IPO’s in 2014 raising over PKR 4.5 Bn in AUM. This is a distinct achievement for an Asset Management Company for which they received the award for Islamic Instrument IPO award 2014. The funds launched include, Al Ameen Islamic Principal Preservation Fund –III (AIPPF-III) (inception date: 20.6.14), Al Ameen Islamic Principal Preservation Fund –IV (AIPPF-IV (Inception date: 16.10.14) and Al Ameen Islamic Principal Preservation Fund – V (AIPPF-V) (Inception date: 26.12.14). The second award conferred upon UBL Funds was for launching the Maximum Mutual Fund IPO s in 2014. UBL Funds launched four new Mutual Funds IPOs in 2014 raising a cumulative amount of PKR 6 Billion. The funds launched under this category include – UBL Principal Protected Fund – III (UPPF-III ) (Inception date: 6.3.14), Al Ameen Islamic Principal Preservation Fund –III AIPPF-III (Inception date: 20.6.14), ), Al Ameen Islamic Principal Preservation Fund –IV (AIPPF-IV) (Inception date: 16.10.14) and Al Ameen Islamic Principal Preservation Fund – V (AIPPF-V) (Inception date: 26.12.14). Both the Islamic Instrument IPO and the Maximum Mutual Fund IPO Awards reflect UBL Funds agility in product development and their commitment to meeting demands of their customers. The Company is a pioneer in launching the internationally renowned CPPI based principal protected funds in Pakistan and has a sound and professional track record of over 14 years as one of the leading Asset Management Companies in Pakistan.